The Multi-Tiered System of Supports (MTSS) is a comprehensive framework that addresses the academic and behavioral needs of all students within the educational system (Hawken, Vincent & Schumann, 2008; Framework for Safe & Successful Schools). Research shows that schools benefit from having available multiple evidence-based interventions of varying intensity to meet the range of behavioral, social-emotional, and academic needs of all students (https://www.ncbi.nlm.nih.gov/pmc/articles/PMC3004682/). 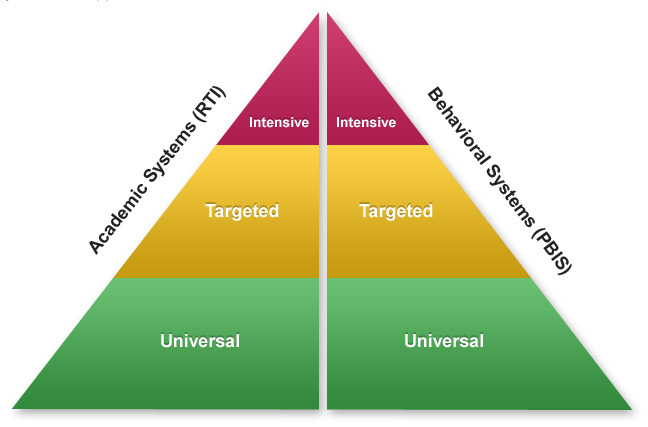 Similar to Response to Intervention (RtI), MTSS is a tiered systems approach of increasingly intensive interventions to facilitate effective implementation of activities and services that focus on core instruction and differentiated interventions to support the academic and behavioral success of all students. Within a MTSS program, Tier 1 is the foundation – the instruction that ALL students receive by their general education teacher within the education process. Preventative in nature, Tier 1 programs and activities are implemented with the entire student population such as school-wide expectations and incentives and core instruction. General education teachers proactively differentiate (modify/adapt) their instructional practices to support students’ specialized needs, providing a more challenging or more supportive learning environment as necessary. Tier 2 is comprised of supplemental interventions in addition to Tier 1 core instruction for students identified through the use of data identifiers/indicators for additional supports such as small group practice and skill building. Tier 3 addresses the students with the highest level of need with supports of a greater intensity specifically tailored to meet the needs of individual students (http://www.illinoisrti.org/i-rti-network/for-educators/understanding-rti-mtss/multi-tiered-system). Below are two images commonly depicted when referring to MTSS. While MTSS is focused on two areas (academics and behavior), the focus of the work of the school counselor is in three domains: 1) academic, 2) college/career, and 3) social/emotional. To reflect this alignment with the work of the school counselor, the Multi-Tiered, Multi-Domain System of Supports (MTMDSS) was created and is depicted in the image below. Similar to MTSS and RtI, the Multi-Tiered, Multi-Domain System of Supports (MTMDSS) is a program planning and decision-making framework that utilizes an evidence-based practice approach to school counseling core curriculum and instruction aligned with assessments to address the needs of ALL students in the three domains of school counseling: academic, college and career, and social/emotional. School counselors are integral parts of the total educational program for student success. The entire school community is invested in student academic achievement, college and career readiness and social emotional wellbeing. School-wide proactive, preventative and data driven intervention services and activities belong to the entire school. Therefore, it is recommended that schools add the third domain (college and career readiness) to their MTSS program and create a comprehensive school-wide Multi-Tiered, Multi-Domain System of Supports (MTMDSS). 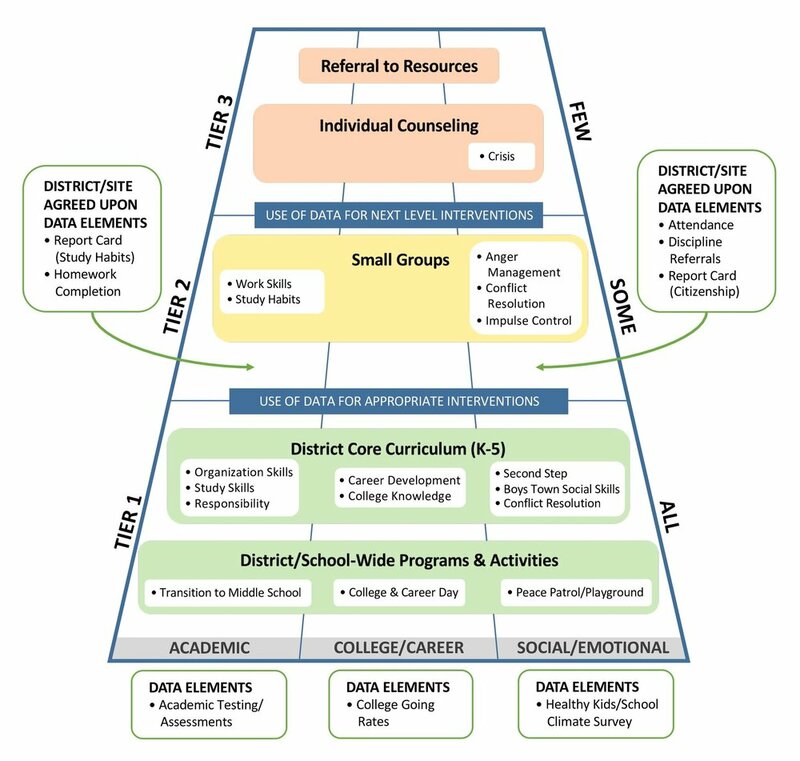 The MTMDSS is a framework (See Figure 1) specifically for school counseling programs to organize a continuum of core instruction and interventions to meet students’ needs with the goals of: 1) Ensuring all students receive developmentally appropriate instruction; 2) Maximizing student achievement; and 3) Increasing the social, emotional, and behavioral competencies of students. The MTMDSS Model organizes school intervention services into three levels, or Tiers. The core program is comprised of the delivery of services that all students receive (curriculum, individual student planning, school-wide events). Standards- and competency-based school counseling core curriculum (formerly called guidance curriculum) is developmental in nature, preventative and proactive in design, and comprehensive in scope. Individual Student Planning includes 4-6 year and college/career planning and career readiness (generally grades 6-12). School-wide activities for all students, such as national awareness weeks and celebrations (e.g. Red Ribbon Week, Mix It Up, The Great Kindness Challenge, etc. ), conflict resolution programs, parent education programs, are provided to all students and/or parents, align with classroom lesson content and standards, and support the core program. Targeted data-driven interventions (small group counseling/instruction, referral to interventions on campus, etc.) are designed for students who are identified by pre-scheduled and pre-determined data screening elements. These include, for example, attendance rates, behavior, work skills and study habits (report card marks), course failure, credit deficiency and/or equity and access issues. Tier 2 includes short term progress monitoring and collaboration among teachers, parents/guardians, and the school counselor until improvement and/or referral to appropriate services can be found and implemented. Tier 2 activities are designed for students who: 1) exhibit barriers to learning; 2) are struggling to achieve academic success; and/or 3) who are identified as deserving of instruction and/or supports in addition to Tier 1 curriculum activities (foster youth, dual language learners, etc.). Individualized student interventions (e.g. 1:1 crisis counseling) are designed for students to address emergency and crisis response events. These include short-term solution focused counseling to address life change events (divorce, death, imprisonment of parent, etc.) provided on a limited basis and, if unresolved, lead to referrals to outside services. This includes short-term consultation and collaboration among teachers, parents/guardians, and the school counselor until crisis is resolved and/or referral to appropriate responsive services can be identified and implemented. Below is an example of a Multi-Tiered Multi-Domained System of Supports for the elementary school level. Please review the Multi-Tiered, Multi-Domain System of Support (MTMDSS) diagram (Figure 1) regarding school counselor activities within a MTMDSS. Next, complete the blank MTMDSS with your current Tier 1, 2, and 3 activities, lessons, and interventions per each domain: academic, college/career, and social/emotional. Look for strengths and potential areas for growth. Within the ASCA National Model (3rd edition), activities within the Multi-Tiered Multi-Domained System of Supports fall within the Delivery component of the ASCA National Model, with a recommendation of 80% of time spent within direct and indirect student services. Previous versions of the ASCA Model suggest that school counselors spend between 15-45% of their time on guidance curriculum (now called core curriculum classroom lessons), depending on their level. Elementary counselors are recommended to teach more lessons and high school is recommended to teach fewer. School counselors are encouraged to use time recommendations as a guide when first beginning to design and implement their program (SEE ASCA GRAPHIC). Providing a strong prevention-oriented framework is key to teaching students foundational and developmentally appropriate skills such as treating others with respect, learning organizational strategies and study strategies, understanding the college readiness and application process, resolving minor conflicts, and beginning the career exploration process. Devoting significant time to teaching classroom lessons and school-wide activities within the Tier 1 framework provides a strong foundation of evidence-based prevention education programs and services that students need to succeed, which reduces the likelihood of students qualifying for Tier 2 and 3 interventions. When counselors spend 80% of their day mired in Tier 2 and 3 reactive services (much like an emergency room) they won’t have time for prevention education and services. These counselors often share their frustration that they are too busy to implement core curriculum. However, without a strong prevention system in place the need for responsive services will continue. By implementing a strong Tier 1 with classroom lessons and school-wide activities, students will gain the attitudes, skills, and knowledge to prevent them from needing Tier 2 and 3 services, thereby reducing time spent in these tiers. Shifting school counselor program activities from primarily responsive to proactive takes commitment, planning, time, and cooperation from administration and faculty alike. As school counselors begin to shift the pyramid to focus more on Tier 1, consideration should be given to addressing the potential challenges of finding balance between the time spent in classrooms and the amount of reactive services they previously provided. School counselors will benefit from scaffolding the transitions at their school site to a proactive approach by adding additional lessons to their Tier 1 action plans each year or beginning with just one grade level and adding a grade level each year. In addition, collaborating with teachers and administrators to gain support for in class interventions, participating on leadership teams, and creating the necessary systemic processes will help to effectively determine which students are referred for additional data-driven interventions of Tier 2 and 3.